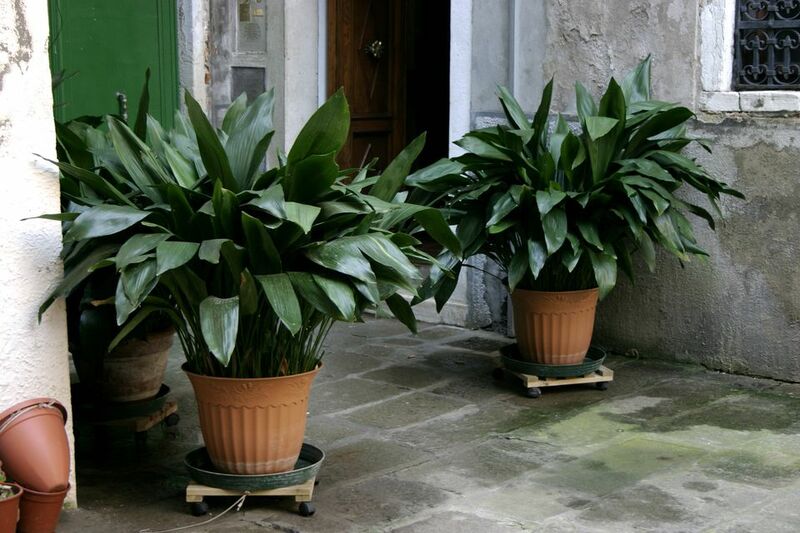 Known as cast iron plants (and ballroom plants), Aspidistra have earned their reputation as nearly indestructible houseplants. They are fairly undemanding and will survive through neglect that would easily kill a lesser plant. They will practically grow in the dark. They're excellent for those difficult to fill areas in deep shade and pet-friendly. Native to the Osumi Islands of Japan, it inhabits forest floors. New species of this plant are currently being discovered throughout East Asia. These tough, attractive plants are members of the lily family. The cast iron plant grows well in low light indoors. Using cast iron plants in landscaping is common as a ground cover under trees. You can also use it as a background plant in your flower bed or along with azaleas for a nice in-between filler plant. They feature upright, strappy leaves that grow from an underground rhizome. The plant has small purple flowers that only appear near the soil surface and are hidden its foliage. Light: Semi-shade to bright, but will not tolerate direct sun. Water: Keep soil continuously moist throughout spring and summer, and reduce watering in the winter. Temperature: Thrives at temperatures from 60 F to 80 F. Does not like extreme cold. Soil: A well-drained potting mix. Fertilizer: Fertilize regularly during growing season with liquid fertilizer, or use controlled-release twice during growing season. Aspidistra plants propagate by division. To start a new plant, take pieces of the rhizome that include at least two leaves. Pot into pieces of the rhizome that include at least two leaves. Pot into fresh potting soil and keep moist and warm until new shoots begin to emerge. Although new plants are slow to grow, with some patience and time, the new plant will thrive. Repot every year or every other year as needed. As rhizomatous plants, cast iron plants can tolerate less frequent repotting. Closely related to the lily, there are eight species in the Aspidistra genus. All are native to Asia. Of these, only one is commonly grown, A. elatior, which features upright green and dark leaves. A. elatior variegata is a variegated version that has attractive white striping on the leaves. The variegated version is less hardy than its darker cousin. For a gardener with a brown thumb, this sturdy, long-lasting plant can be used in areas where all else fails. It is always green and can handle deep shade under deck stairs or along foundations that receive almost no sunlight. This hardy plant thrives in very hot, dry summers and is not easily damaged by cold winters. Insects seem to leave it alone, and it very rarely is bothered by disease of any kind. These are highly dependable, attractive, and tolerant plants. The vast majority of mistakes with cast iron plants are caused by either too much water coupled with dark corners (they dislike waterlogged soil) or by direct sunlight, which will cause leaves to turn yellow, then brown and die. Older plants can often be rejuvenated from intact rhizomes, even ones that might seem to be dried out from lack of water. These are also great patio plants.